Talk on Tuesday, 30 April 2019, 7.30 p.m.
Talk, following the Society's AGM, by Matthew Cawthorne on "The Lykovs: a family of Old Believers lost to the modern world". At St Luke's Church, Langley Way, Watford. Member: £3; non-member: £5. Talk on Monday, 3 June 2019, 7.30 p.m.
A talk by Ruth Sobel on "Remarkable women from Novgorod". At Watford Quaker Meeting House, Church Road, Watford. Member: £3; non-member: £5. The proposed visit of the English Society from Novgorod will take place around 16-25 July 2019. The meal with Russian food and wine pairing will take place on Tuesday, 19 November 2019. Watford-Novgorod Friendship Society (WNFS) was set up in 1995 with the aim of bringing together all those in Watford interested in promoting friendship with Veliky Novgorod. The town twinning was established in 1984 and has resulted in many exchanges and visits in both directions. The Society's activities include talks on subjects such as Russian history and culture, the publication of a small, occasional magazine, Courier, social events including dinners with Russian or East European food and wine, occasional parties, and liaison with the English Club in Veliky Novgorod. The subjects of our varied talks have included "Our visit to Novgorod", "Roaming around Kamchatka", "The Novgorod composers, Rachmaninov and Arensky", "Russian lacquer boxes", "Matryoshka dolls (Russian nesting dolls)", "From the USSR to Russia …. and Back Again", "Anton Chekhov: his life and works"; "Belarus: its fascinating history", "Russian political posters before and after perestoika" and "You'll die laughing" (on Russian humour). On a number of occasions, usually alternating at two-year intervals, some members of our society visit Novgorod, or Russians come to visit Watford. Thanks to their hosts, visitors get to see more of life abroad than tourists usually do. When a group of about a dozen Russians last came to Watford, visits arranged for them included ones to Canterbury, London and Frithsden Vineyard. There were also welcoming and farewell parties, a musical at the Palace Theatre and a canal boat trip. 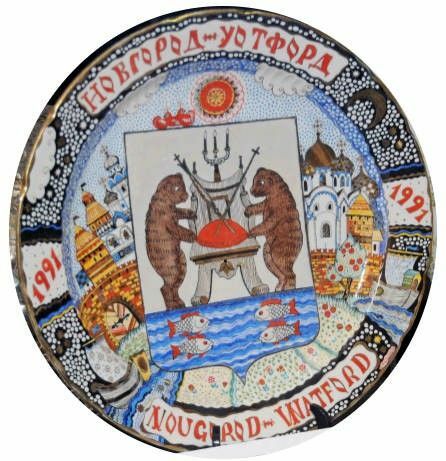 A plate to mark the Watford-Novgorod link. It was featured in a BBC programme in 1991. The full name Veliky Novgorod means "Lord Novgorod the Great". Veliky Novgorod has about 200,000 people, about twice Watford's population. It lies in Russia, approximately 120 miles south of St. Petersburg. It is to be distinguished from Nizhniy Novgorod (Gorky) which is located on the Volga, to the east of Moscow. The first recorded mention of Watford was in the will of Ethelgifu (wife of Edmund, a Saxon King, grandson of Alfred the Great) in 946. Before that time, Watford was part of the Manor of Cashio, which is mentioned in the Doomsday Book. Key to the City of Novgorod, presented to the Borough of Watford to mark the inauguration of the link between the two towns, 17th March 1984. The address is shown in a way intended to deter web "spiders" that collect addresses to send advertisements (or worse). Replace the "#" with "@" and omit the spaces! Membership of the Society is open to all. We are glad to have several members who speak Russian, but most members do not and are not expected to. If you are interested in joining the Society, but not sure, you are welcome to come to one or two meetings as a visitor first. The annual subscription is £10 or, for a student, £5. To join, please write to the Society (at the above e-mail address), giving your name, address including postcode, e-mail address and optionally your telephone number. We will then let you know about payment by cheque or bank transfer. Alternatively, you can join when you come to one of our meetings.